This will probably get me in trouble, but... I think it's possible that children shouldn't be allowed in church, at least not until they've been trained. I don't mean that typical genteel parental kind of training. I'm talking more like kid-to-kid warning and wisdom. Call it "How-to-Survive-the-Next-Hour-Without-Getting-Spanked-101." For example, I learned at a very young age that, when the elderly Edith Cooper began her weekly snore, looking back at her would invariably produce a tiny ping from my mother's index finger. Mother was a firm believer in the Head-Always-Forward theology. Once, when the second to the last pew completely collapsed, sending three people through the floor into the basement, emitting a cloud of centuries-old dust, I hesitantly glanced up at my mother only to watch her simply nod to the pastor and quietly say "Amen." She was a rock. Young children coming to church for the first time need to be warned. Don't look back! Or if you must, do so with technique. I eventually learned that if I dropped the bulletin at the correct moment, when returning from my retrieval lean, I could swipe a quick backward glance that was, if not elegant, at least permissible. But there is a firm once-per-service allotment of this technique. Use judiciously. You've been warned. 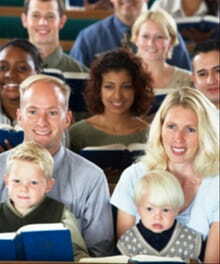 Children should also be told about the risks involved when they are all taken up front for a "children's message." Who invented this terror-filled activity? This situation is fraught with peril. The first rule is simple — don't offer anything unless asked. The second rule is also simple — when asked "How do we prepare our homes for an honored guest?" never answer with "Mommy finally cleans the basement toilet." Again, you've been warned. While there is a risk in saying too much, there can also be a risk in saying too little. A visiting pastor shared with us a time when he called all the children forward and asked a seemingly simple question. "Hi, kids! Got a question for ya'. What's little and gray, has a long fluffy tail, skitters around on trees and stores up nuts for the winter?" Total silence met this man's eager face. A little surprised, he nonetheless cheerily continued. "Oh, come on, guys. Let's try again. Little and gray, long fluffy tail, skitters around on trees and stores up nuts for the winter." Again... not a peep, but this time the children's eyes were huge and fearful. This visiting pastor was clearly becoming agitated. "Kids... this isn't tough. The story won't work unless you answer. So help me out." He shot through the question again. "Little and gray. Long fluffy tail. Skitters around on trees. Stores up nuts for the winter!" Finally, one kid timidly raised his hand. Clearly fearful at this line of questioning, he nonetheless took a deep breath and said, "Pastor ... I know we're always supposed to say 'Jesus' ... but that really sounds like a squirrel to me." This kid knew one of the most basic forms of church survival. When in doubt, answer "Jesus." Nine times out of 10, it'll be the answer they want. But, as it turns out, listening is also a pretty good strategy. Who knew? I actually love the buried truth in that concept. When in doubt, answer "Jesus." Not only is it usually the right answer to the teacher's question, it's the right answer to most of life's questions. I love it when we actually learn something from our kids. Children are so beloved of Jesus. He took their previous status in the ancient Roman world as disposable second-class citizens and turned it on its head. Not only did he welcome children to his ministry, even into his arms, he went on to elevate them as an example of the childlike heart and meekness with which we, the adults, should approach the throne of the King of the universe. My mother always said that a church without children is a dying church. She meant it. She and my pastor father regularly drove our battered orange VW van round the town early on Sunday mornings, gathering up any child in our little community whose parents would part with them for a few hours. Often these kids were poorly dressed, tired, hungry and, once in the pew, ... a tad squirrely, but they were always excited to jump in the van, go to church and learn of the surprising truth that they were wanted, beautiful and precious in the eyes of a loving Savior. Once, when this busload of kids was showing their lack of church culture etiquette, one church member bitterly complained to my mother. "Those children are dirty and misbehaved. They're sitting up there on the front pew and they have no idea how they're supposed to act in church. What are you going to do about it?" My mother's answer? My sweet mother, who was really uncomfortable with such direct confrontations? THAT mother? "You mean what am I going to do with a bunch of children who are so new to church that they don't know how to behave? I'm going to go out and get as many more of them as I can." I liked that answer. Fill God's church with people who've never been there before, who don't know all the churchy culture, stuffy rules and complex etiquette. Bring in anyone and everyone who just wants to know that they are loved, needed and precious. After all, they are a metaphor for us. Didn't we all come to Christ the same way? — messy, hungry and totally clueless as to how we should behave?